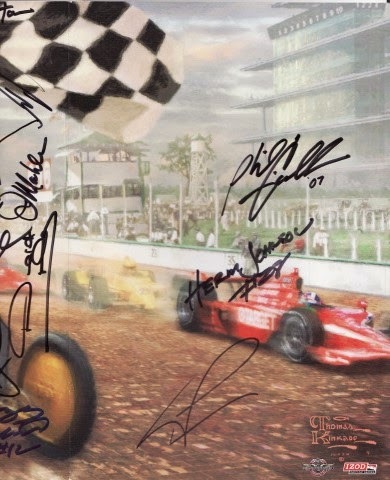 Bob Lazier; #91, Tyce Carlson, Buzz Calkins, #12*, John Mahler, Spike Gehlhausen, Herm Johnson, #20*, Phil Giebler ’07 ROY*, Scott Harriington and Max Papis*. Bob Lazier, father of 1996 Indy 500 winner Buddy and IndyCar competitor Jaques raced in the Championship Auto Racing Teams (CART) series in 1981 where he won Rookie Of the Year honours with best finishes of fourth place at Watkins Glen and Mexico City, which I was totally unawares' of. Tyce Carlson employed the late "Dr. Who" (Tim Wardrop) as his race engineer for not only his Indy Lights team, but their lone Indy 500 outing to date with "Mean Jean" (Alesi) in the "slotus!" 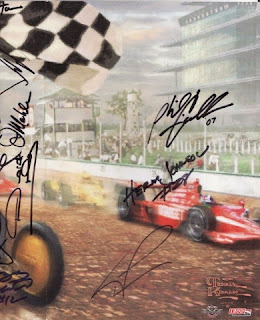 As still recall Tyce telling CARPETS' and Mwah "We're still in Business" as we approached him for his autograph, as apparently Tyce had overheard us ponderin' if Fan Force United was still racing cars in Indy Lights? Spike is one of the countless drivers I've heard interviewed on Autosport Radio and has a most unusual business, as President of Ultra Chemical, an environmental services company which I believe is certified to dispose of nuclear radioactive waste! Kudos to No Fenders 'Offical Photographer and IMS Sherpa Dave 'CARPETS O'Brien!